Another quiet week wildlife-wise as I am still mainly looking after the family - (hence the redesign of the website and the addition of the 'Gyr Crakes' section - click the link in the nav bar above to view). Last night there was some drizzly rain and some easterly in the breeze and I thought there was a chance of a scarce migrant or something rarer. So I had a couple of hours time out at Fort Doyle/Fort le Marchant this morning. Unfortunately there was not a mass of migrants about but I had a pleasant walk nevertheless (and ticked Nettle-leaved Goosefoot). The highlight was a Hobby that motored in from the north, in off the sea and carried on south. It had probably left Portland or Start Point at dawn. Willow Warbler - Fort le Marchant, 17 Aug 2011 - these bright autumn Willow Warblers are just splendid and one of my favourites. The above Willow Warbler was found in the small 'valley' just to the East of Fort le Marchant approach road. It is a clearer area amongst the extensive gorse, with a few small willow trees and a little marsh. It is one spot that I have identified as a 'migrant trap'. These are small areas that always seem to have concentrations of migrants - today, all but two migrants warblers I saw were in these few trees. They are spots which are usually sheltered and often with slightly different habitat than the surrounding area which is more attractive to migrants. The kind of place to check early morning as birds will probably move on quickly. I have not found anything mega there - the best I think is a Wryneck - but I wish I had the chance to check it daily in migration season. The 'migrant trap' at Fort le Marchant. In the afternoon I managed an hours walk around Pleinmont but migrants were few. There were still a few Swifts feeding around the cliffs before they made their journey south. Despite my lack of birding, I have managed two World ticks this week. Apparently the AOU have done some splitting and the American race of Kentish Plover and Moorhen have been split as two new separate species - Snowy Plover and Common Gallinule (?). 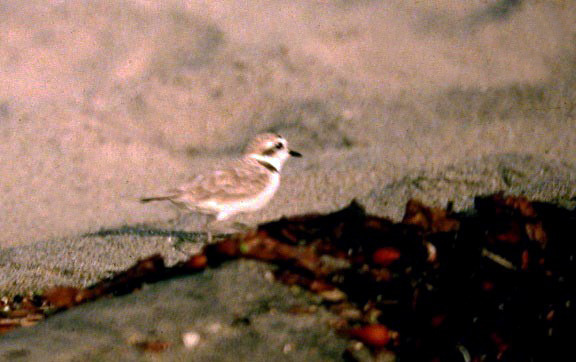 I have seen these birds years ago on our family holidays to California and Florida respectively.